Acclaimed at Bath last year and sold out at London's St James Theatre in January, Bad Jews now makes the short hop across town to the Arts Theatre to meet an almost insatiable demand to see the show. Indeed the clamour for tickets has been so strong that it led comedienne Ruby Wax to tweet recently of Bad Jews' "mostly Jewish audience. If you insult them, they will come”. 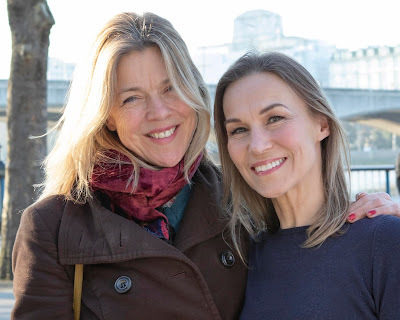 The play is provocatively titled because as Harmon admits in the programme, eleven years ago and before a plot had even evolved, he thought it would be "a good title for a play". Hmm. A dodgy premise for any creative work. Substance needs to come before the packaging and ultimately Bad Jews makes for mediocre drama. Three Jewish cousins (plus Melody the Christian girlfriend of one cousin) are gathered in New York for the funeral of grandfather Poppy, a Holocaust survivor. Amidst familiar and familial spats of jealousy, rivalry and momentary affection, the plot's action focusses upon a Jewish necklace (a Chai) that Poppy had kept concealed during his time in the camps. Religiously committed granddaughter Daphna believes the Chai should rightfully be hers whilst assimilated cousin Liam (who via some family chicanery, already possesses the necklace) is on the cusp of proposing to Melody and plans to give her the Chai in place of a traditional engagement ring. Daphna’s nauseated fury at Liam’s plan is understandable. However where Harmon abuses our disbelief, whose suspension is already hanging by a thread, is in asking us to accept the conceit that WASP Melody would even prefer the battered Chai over a diamond solitaire. It makes for an in-credible pivotal plot-line. To be fair, Harmon does thread some strands of relevance into his work. His exposition of the vain and arrogant self-belief of Daphna's piety is spot-on and he offers a further morsel of intellectual meat to chew on as he references the impact of assimilation and "marrying out" upon Judaism's cultural heritage. Noble arguments and credit too for his attempt to address the impact of the Holocaust upon third generation survivors. But ultimately it's all packaged up in a bundle of writing that far too often makes for a tedious naivety. Where Arthur Miller once brought a scalpel-like precision to such complex studies of humanity, Harmon wields mallet and chisel and it shows. Speaking to The Guardian recently Harmon tells of how just before the play opened in Bath, that he had cut a line from the text that referred to the safety in being Jewish today, recognising that the sentiment didn't accurately reflect the current experience of European Jews. Whilst the edit was necessary, actually the chopped words should never have been written in the first place. For most of the last millennium continental Europe has been a deadly place for Jews - and that's both before and after Hitler - and Harmon's failure to acknowledge that continuum, even as he wrote Bad Jews, evidences a worrying ignorance. And that side-splitting comedy? The programme notes reference Mel Brooks’ The Producers in which Brooks brilliantly lampooned Hitler in his 1968 farce and subsequent musical. However, that The Producers worked at all was because Brooks craftily mocked an evil regime. 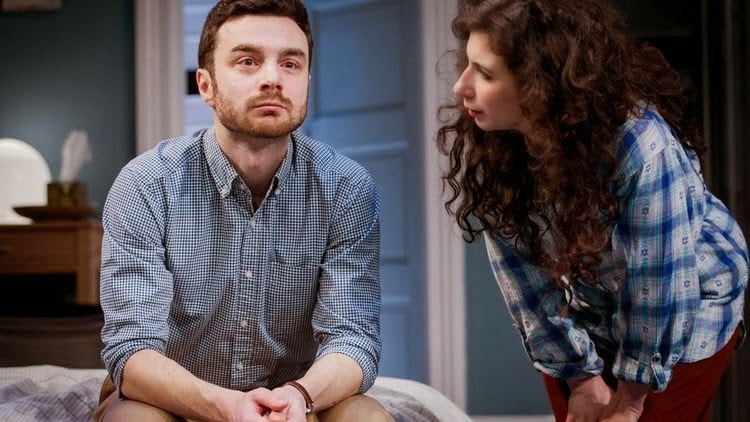 Here, by contrast, Bad Jews' audience rather than laughing at the Nazis, are invited to guffaw at a surviving family's struggles to cope with the Holocaust's devastating legacy. There’s a whiff of freak-show here and it leaves a nasty taste. Further credit to some of the performers. Ilan Goodman's Liam is a focussed channelled force, who notwithstanding the ridiculously Fawlty-esque extremes imposed upon his character, makes us believe in his comfortably assimilated Jewish identity, as well as his love for Melody. Playing his love interest, Gina Bramhill is a strawberry blonde genteel gentile. It's a novel twist that sees the non-Jew sketched out as a caricatured stereotype, but again and to her credit, Bramhill makes fabulous work of some occasionally ghastly dialogue. That Jenna Augen's Daphna, almost a year into the play's run, speaks too often in a squeaky gabble is mind boggling. Completing the quartet, Joe Coen's Jonah is the Beavis-type silent one, who too little too late offers an endgame revelation that deserves more analysis from Harmon than the (yet another) sensational moment it is given. In his song Shikse Goddess, taken from The Last Five Years, Broadway composer Jason Robert Brown, nails the complex and awkward nuances of assimilation with witty yet profound analysis in four minutes. Harmon takes more than an hour and a half to clumsily cover much of the same ground. Somewhere in Bad Jews there could be a good play struggling to emerge. This ain't it.